Design your campaigns with your CRM in mind. A campaign is a programmed effort to create awareness about your products and/or services to a defined group of people with the intention of driving them toward a conversion. A good campaign is planned out, with a journey model and people to support leads as they progress through their journeys. Campaigns can be designed to be almost anything you can imagine, but I focus on a few standard, effective methods of coming up with your automations. All campaigns should have goals; bring sales, marketing, and operations teams together to discuss and agree on their responsibilities in bringing leads through their journeys to meet those goals. Building a model of your campaign is important, both from a planning and an execution standpoint. A comprehensive campaign model demonstrates to management that your goals are in alignment with your overall business strategy. A good model also involves everyone who supports the contacts receiving the campaign communication, so your employees know what is happening and why. Complete CRM gives you the ability to connect every part of your business with the campaign process. Campaigns start with marketing to your target market, but they also involve follow-up marketing communication, interactions with salespeople, and operational elements such as customer service or attending events. Build as many components into your campaigns as possible. Personalize the experience around demographics, preferences, and actions. All of these are captured in your CRM, so use them to your best ability. Delay: A delay gives the lead or customer time to make a decision or take an action. A delay is useful when you need to give the contact time to think, or have something happen asynchronously. An example of a delay is waiting for a recipient to read an email. Decision: The contact needs to make a decision at this point. It can be something active, such as visiting a webpage, watching a video, or clicking a link. It can also be something passive, such as using demographic data associated with the contact. Action: An action you take, such as sending an email, sending a text message, altering data in the CRM, scheduling a CRM activity, or sending a printed marketing piece. This model shows the entire buyer journey and anticipates all the things a contact can do along the way. Use this model to anticipate fast-movers (your most interested buyers) and your reluctant buyers. If you can use automation to address the needs of people on your journey, do it. Part of a journey that includes all three elements of a model. Your CRM plays an important role in applying this model to real life. You may have places in the journey where a salesperson calls on a lead. Make sure that salesperson has the information and tools needed to effectively follow up. A good CRM implementation provides the demographic and behavioral information that a salesperson needs to make the most of the time spent communicating with the lead. Drip campaigns are automated sequences of emails or workflows. A specific action or date can trigger a campaign, such as when someone fills out a form, or someone pays for a membership. Because drip campaigns are generally linear in behavior, they tend to not have as much logic built into them, like a journey does. A great use for drip campaigns is client onboarding. Ensure a new client receives a sequence of emails that shows her how to use your product. A drip campaign can send that information in smaller, easier-to-absorb emails. Tracking of drip campaigns over time can also illuminate how people engage with your messages. If you notice that certain stages in your drip campaign perform exceptionally well or badly, dive deeper to find out why. 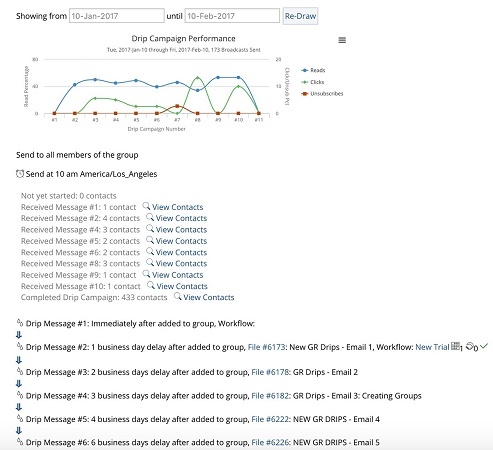 Here is a typical drip campaign overview with summary performance data, as well as basic structural data about the emails and workflows associated with the drip campaign. An overview of a drip campaign.